Holy Family Memorial recognizes Deb Gillen, Education Department, and volunteers Mike and Mary Lee Brunet as second quarter winners for the HFM Inspired Caring Award. Together, the Brunet’s have provided almost 4,000 hours of service since they started volunteering at HFM in 2002. 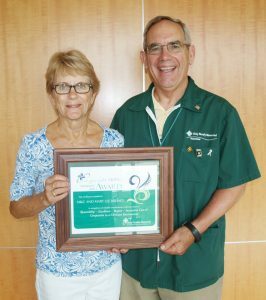 Mary Lee volunteers at the HFM Medical Center’s Information Desk and Mike escorts patients, volunteers in the Chapel and Education Department, and serves as a member of the Volunteer Leadership Committee. 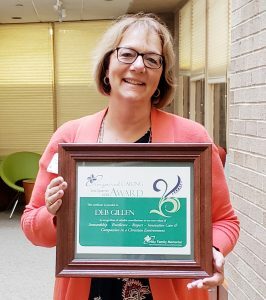 The Inspired Caring Award is presented quarterly to an employee and volunteer who exemplify HFM’s core values of stewardship, excellence, respect, innovative care, and compassion. HFM employees have the opportunity each quarter to nominate a colleague or volunteer who strongly demonstrates all of the core values. ← HFM Heart & Vascular Center welcomes new nurse practitioner.